When Google launched App Engine about one year ago, many were excited about their expected move into the cloud computing space, but at the same time, dismayed that it only supported Python, a language seemingly favoured at the Mountain View-headquartered company. However, Google was adamant that they would begin supporting new languages and began taking requests on their issue tracker for what language to support next. So, it was no surprise that support for Java was announced last week as part of an “Early Look” at the feature. The Google App Engine page indicated that access would be limited to the first 10,000 developers who signed up, but I was able to get approved for access after signing up over the weekend, even though Java support was launched last Wednesday on April 8th. Google has since expanded the “early Look” to accommodate a total of 25,000 developers, so be sure to sign up if you can! The choice of Java as the next language to support was no big surprise, as indicated by many articles speculating on the matter. Furthermore, Java is one of the most popular languages out there, both outside and inside Google, making it a logical choice. This is seen by the numerous Java projects Google has created/supported, such as Google Web Toolkit and Google Guice. Additionally, Java is second to none when it comes to a viable developer ecosystem, which has resulted in great open source projects such as JBoss, the Apache Commons collections, and other libraries/frameworks that have provided great tools to any Java developer, allowing them focus on developing their application instead of worrying about lower-level problems. There are also a great many websites out there running on J2EE, such as LinkedIn and numerous corporate websites. However, this hasn’t translated into the availability of cheap web hosting for J2EE/Java development. Typically, web hosting for a shared-server solution will be only a few dollars per month if you’re using a scripting/interpreted language like PHP, Python or Perl. If you want to develop Java web applications though, you’ll likely have to pay much more due to the complexity and overhead of the hosting provider having to run a Java VM. As outlined in this somewhat overly optimistic article, Google’s support for Java in App Engine has the potential to change the game by offering a cheap/low-cost, or in most cases, a free solution to allow developers to begin creating J2EE/Java-based web applications. This will have the effect of encouraging greater adoption of J2EE as a server-side solution. In my opinion, the high cost of Java web hosting has indeed hampered its adoption by the community, as compared to alternatives like PHP, Python and Ruby. 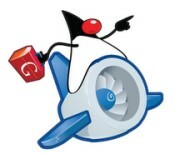 As for me, I’m currently devoting my free time to experimenting on App Engine using Java. So far, the documention and tutorial seem to be fairly well-written and easy to follow, and for the most part App Engine is using the standard Java APIs for providing most of their service functionality. Furthermore, Google has made an excellent Eclipse plugin for App Engine Java support, which provides not only the SDK, but also a built-in development server/Jetty-based servlet container for local testing, but also the tools necessary to upload your application to Google’s servers directly from the IDE. Another reason why Eclipse is the best IDE out there. I hope to have something working within a few days, at least to test the service and play around with its capabilities. Overall, I’m very impressed!